Hina Panchal, MD MPH, Avraham Sheinin, BA, Meghana Shamsunder, MPH, Clifford C. Sheckter, MD, Shantanu N. Razdan, MD MSPH, David Rubin, BS, Robert Allen, Jr., MD, Jonas Nelson, MD, Babak J. Mehrara, MD, Evan Matros, MD, MMSc, MPH. Background: Across the US, rates of autologous breast reconstruction are relatively stagnant compared to prosthetic techniques. The payment disparity between microsurgical autologous breast reconstruction (MABR) and competing methods has been proposed as one of several barriers. Physician payment differences between governmental and commercial payers set up a natural experiment to evaluate the impact of payment on the method of breast reconstruction. The study aim is to demonstrate rates and variation in physician payments for MABR and implants by insurance type. The hypothesis is that physician payment is a barrier to MABR. Methods: The Massachusetts All-Payer Claims Database was queried for women undergoing post-mastectomy immediate breast reconstruction using MABR or implants from 2010-2014. Univariate analysis was performed using Chi-square test. 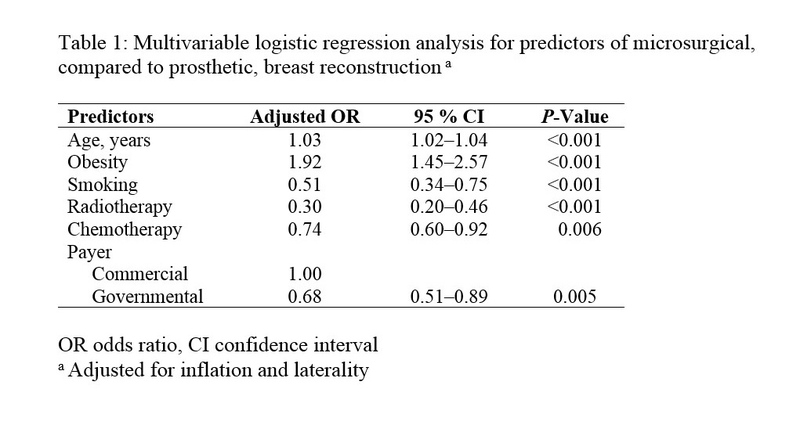 Multivariable logistic regression models were created exploring the association between insurance type and method of immediate breast reconstruction. Results: 2,879 women were studied with a median age of 49. 82.7% of all women had commercial, while 17.3% had governmental insurance (12.7% Medicaid and 4.6% Medicare). 80% of women received implants, whereas 20% underwent MABR. Women with Medicaid compared to commercial insurance had lower rates of MABR (16.4% vs. 20.3%; p=0.053). Commercial insurance, older age, and obesity independently increased the odds of MABR, whereas, smoking, radiotherapy and chemotherapy reduced the odds of MABR (all p<0.01) (Table-1). When comparing median physician payments, governmental payers reimbursed 76% and 60% less than commercial payers for MABR ($2,125 versus $8,763) and implants ($1,648 versus $4,053), respectively. A second multivariable model, which included payments, showed that greater physician payment increased the odds of MABR, independent of insurance type (p<0.001). Conclusions: Physician payments for breast reconstruction services are less for governmental than commercial payers. Importantly, women with governmental insurance have lower odds of undergoing MABR, and this was directly associated with physician payment. Current MABR reimbursements may not be commensurate with physician effort when compared to prosthetic techniques.